I know I probably talk about Tatcha way too much (I swear I really do use other products! There's a Shiseido serum I would like you to meet...), but I feel like I'd be remiss if I didn't share the ~40% off Tatcha deal I found on Gilt City. I am very tempted to get the $90 credit to splurge on a 10 pack of Revitalizing Eye Masks (reviewed here). In other news, after two amazing years of staying at my Hell's Kitchen apartment, it's finally time to move on. My next apartment will be in a quiet neighborhood located in the Upper West Side. It's going to take some time for me to set up a new photography space (fingers crossed for everything to go well) so you may see more Instagram-style photos in the meantime. My apologies in advance! Also, if you haven't already signed up, today is the last day to participate in the Tatcha x Messy Wands giveaway. Don't miss out on your chance to win a generous-sized Radiant Deep Brightening Serum, or at the very least, receive an exclusive promotional offer when the giveaway ends. All good things, my friend. My dear friend and beauty editor extraordinaire Phillip Picardi (and literally the prettiest man I know) hosted a Guerlain event at Bergdorf Goodman yesterday, which was a perfect excuse for me to pop by and play with the new Guerlain KissKiss Shaping Cream Lip Colors. 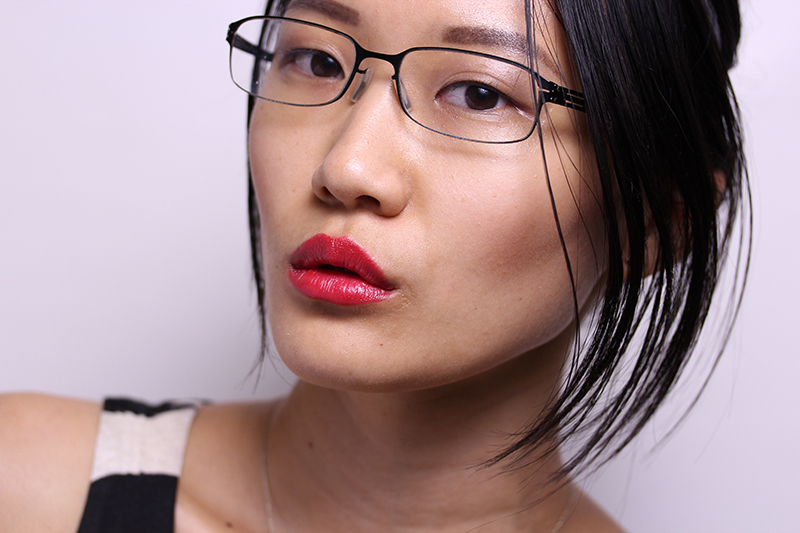 Featured here is 325 Rouge Kiss, a coral red that surprisingly works on me (they usually pull too warm). 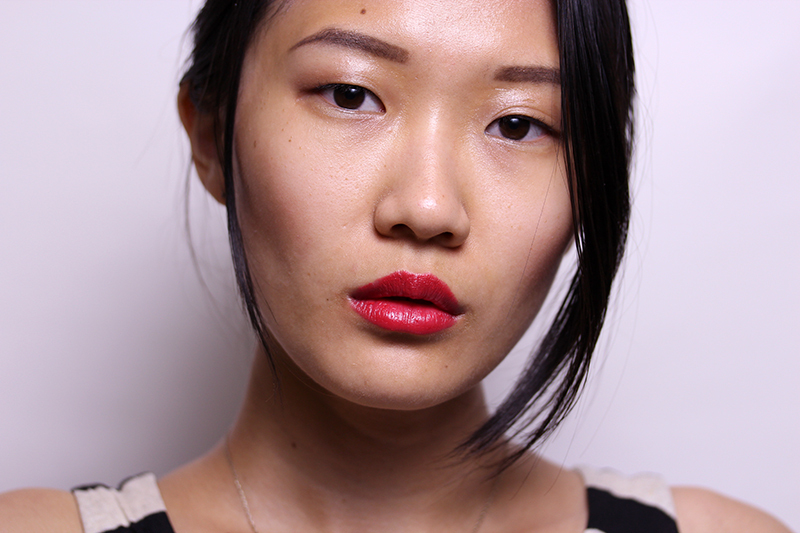 The formula is slightly heavier and more emollient than the Rouge Automatique, and is definitely a lipstick you can "feel." It can be applied as a light stain or layered on for a full-coverage finish, as shown above. I've only had this for a day, but it's making a fantastic first impression. While getting rid of stuff for my impending move (50% of my nail collection, tragically given away! 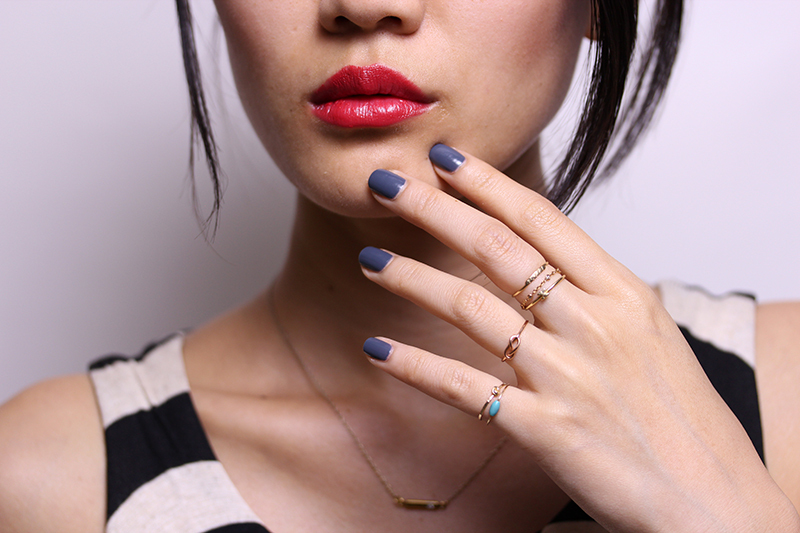 ), I stumbled across the dusky blue Rescue Beauty Lounge Forgotten Road and rushed to put it on. Have I told you how much I love in-between colors? My favorite ones make you just a little unsure what tone it is. Forgotten Road straddles blue and gray and looks like either depending on the light. How exciting! Also, I have three new additions to my dainty ring collection! Accompanying the Catbird stalwarts are an Erica Weiner Infinity Ring and two pieces by Guenevere Rodriguez, all Brooklyn-based jewelers. If you are fortunate enough to live in Manhattan, Guenevere has a stall on weekends on Prince St between Mott & Mulberry. Prices at that location are significantly less than on the website. Guerlain KissKiss Shaping Cream Lip Colors retail for $37 and are currently only available online at saks.com. I received mine as an event gift at Bergdorf Goodman. The lovely people at TATCHA have generously provided a special sampling opportunity for Messy Wands readers! They're giving away travel-sized samples of the Radiant Deep Brightening Serum to 50 lucky winners. All you have to do is sign up here by August 23, 2014. If you weren't one of the 50, do not fret! Everyone who signs up will receive an exclusive email promotional offer when the giveaway ends, which is a pretty sweet consolation prize. I first reviewed this serum two years ago in my first ever post on TATCHA. While I still believe that the effects of serums are difficult to measure and nothing can replace eating and living healthy, I do think the Deep Brightening Serum is a bottle of particular magic. Throughout the years, I've seen the proof that it lightens acne scars and combats hyperpigmentation, and whenever my skin flares up due to product testing (occupational hazard), this serum calms the skin down and heals the ill effects within a couple of days, without fail. I've never been without this serum on my vanity since I first had it, and I never want to be. It's my skincare anchor, if you will. I took five months to finish the full-sized serum with daily use, so this travel-sized version should easily last over a month. I urge everyone to give it a try! 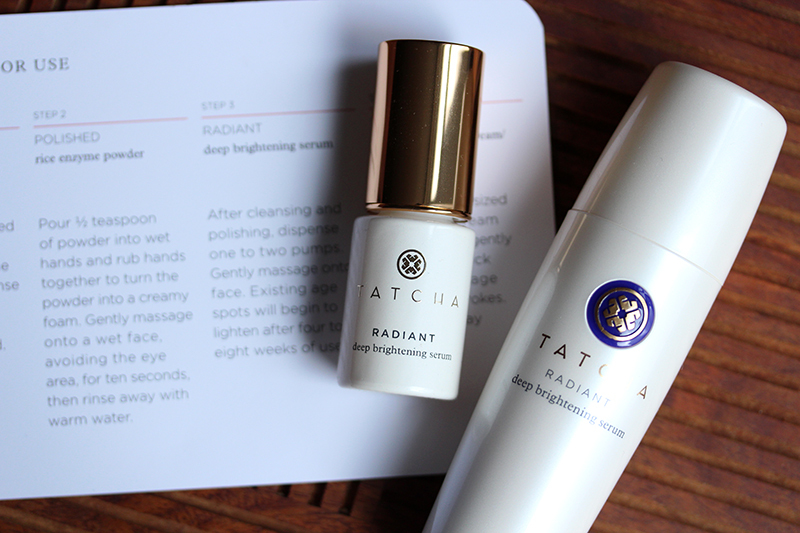 Click here to enter the TATCHA Deep Brightening Serum giveaway! *The giveaway ends on August 23, 2014. Valid for US residents only.